It seems straightforward: a table is just a table, no matter what room it’s in, right? Well, not quite. Believe it or not, kitchen and dining room tables aren’t the same. The distinctions between the two impact how you use your kitchen and dining room areas, the flow and feel of your home, and the lifestyle these rooms allow you to lead. And when you’re trying to decide what tables to purchase for your home, the details make all the difference. When choosing a kitchen or dining room table, start by asking yourself: what sort of lifestyle do I dream of living? Do I want a grand, traditional home with a dining room for hosting parties and holidays? Or do I want a cozy little nest with functional, no-nonsense spaces? Depending on your vision, you may want either a large, formal dining room table or an intimate kitchen table. If your house has the space and you want the best of both worlds, you can always consider one of each. Kitchen and Dining Tables: Which One is Right for Your Family? A room should communicate what activities are meant to go on there. And while everyone knows what a kitchen and a dining room are functionally for, what about the atmosphere within the room? A table plays a big role in setting the mood in each of these rooms. Kitchen tables can be rustic, suggesting afternoon coffee sessions with neighbors or Sunday morning pancake breakfasts with kids. Or they can be simple, modern, easy to wipe-down surfaces for packing purses or lunch boxes while on the go. And the story’s the same in the dining room—the type of table you select sets the stage for all that will go on there in the future. Kitchen tables tend to be smaller than dining room tables. 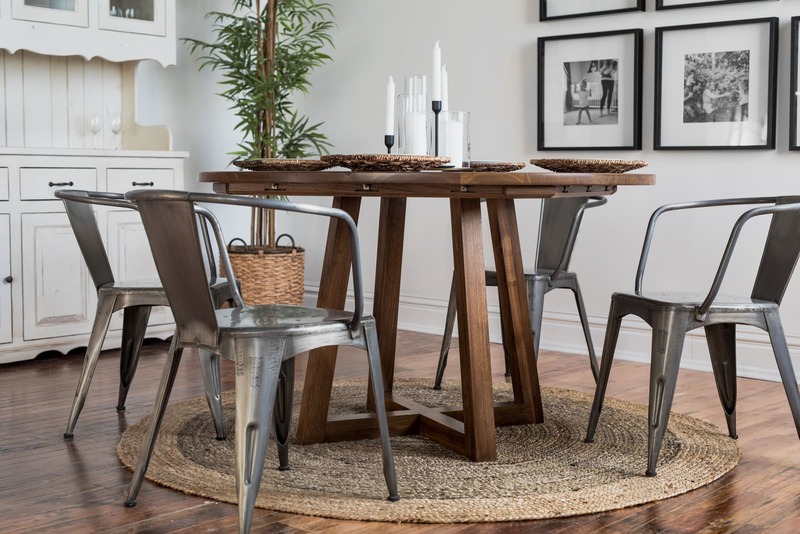 They may be square or rectangular, but perhaps one of the best shapes for a kitchen table is round, which encourages socializing and makes it easier to reach dishes or kids in high chairs. Kitchen chairs are often simple and unupholstered, and bench seating is also popular. Dining room tables are far bigger and seat more people. They are most often rectangular, although you may find some that are oval in shape. Chairs tend to be wider in the dining room to allow for more elbow room and comfort, as no one wants dining guests to feel crowded. They may also have padding or armrests encouraging guests to relax and linger around the table long after dinner is over. Once you have a sense of atmosphere you envision for each of these spaces, you can begin digging into the details. Size: Ask yourself how many people you want to be able to seat. Most dining room tables can seat between six to eight people without adding extending leaves, while some extra-long tables can accommodate ten to twelve. For greater seating flexibility, choose a table that can be lengthened or shortened by adding or removing table leaves. If you’re someone who loves to entertain, you should consider getting a table that seats an ample number of guests, as well as a sideboard [<--link to sideboard piece when live]. Sideboards reduce the amount of clutter on the dining table by offering extra space for things like wine, condiments, or dessert dishes, and can also be used to serve buffet-style meals. Formality: Consider how formal you want your dining experience to be. Will your dinners be fancy events, or more casual family-style affairs? Many people love the warmth and richness of a formal dining room, but don’t go overboard. If your dining room looks too formal, it will only be used on formal occasions, even if it is functional enough to accommodate everyday use. Shape: If you're looking for a traditional dining style, choose a rectangular table. Common elements of this style also include: a china cabinet or sideboard that matches the table, curtained windows, hard lines, and accessories such as mirrors, hanging chandeliers, or candles. Traditional dining rooms often have silver, china, or glassware on display. Lighting is sometimes dimmed here, which will encourage quieter conversation. Size and Utility: An oversized table will disrupt the flow of traffic, and an undersized table will make mealtimes chaotic and crowded. Like the casual dining room, kitchens tables are used for a variety of purposes: breakfasts, after school snacks, family meetings, homework, casual dinners and games can all happen around the kitchen table. So be sure to choose a table that will seat all your family members comfortably. Kitchen tables usually seat four to six people and are round, square, or short and rectangular. If you have a two-person household, you may decide to go for bistro-style seating around a very small, intimate table. And if guests show up, having a larger dining room table to move to is a wonderful option. Room flow: When choosing your kitchen table, keep the traffic flow and your kitchen’s layout in mind. People seated at the table want to be in talking range of whomever is working in the kitchen. Think about your family’s needs. Do you have small children? Choosing a round table can prevent accidents, as square or rectangular tables have pointed edges. A table that has a single central leg rather than four at each corner makes it easier to push chairs in and out. And if you don’t have enough counter space, a table that’s level with your counters can give you more room to work. Decor: Finally, choose a table that will fit your kitchen’s decor style. Kitchens are known to be airy, ventilated areas, and people often decorate them with the brightest colors found in the home. Popular styles include Mediterranean, old world, farmhouse, cottage or contemporize. But it’s a versatile room, so don’t be afraid if you want to try something more eclectic. 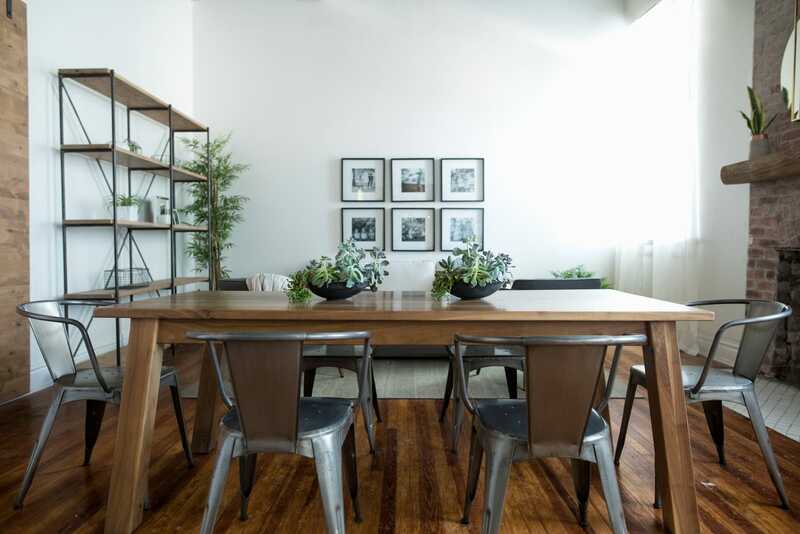 Purchase Custom, Hand-Built Tables that Match Your Space. Your kitchen and dining room tables are pieces that will support your family’s way of life for years to come. They define your style and lay the groundwork for your chosen decor. Given time, they’re where you’ll gather with friends and family to make memories, so it’s worth investing in quality kitchen and dining room tables that are going to last. Your furniture doesn’t need to be generic or factory-made. 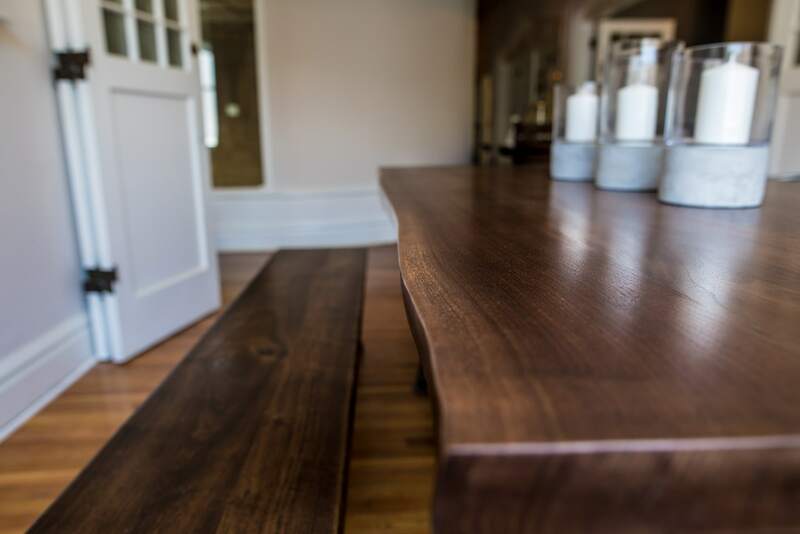 You can order a custom, hand-built table tailored to fit perfectly in your home. Ordering your kitchen or dining room table from master craftsmen who are passionate about every piece of furniture they build can help make your home feel one-of-a-kind. And, if you can’t pick one or the other, you can order both a custom kitchen and dining room table to ensure you have a space for every occasion. Unruh Furniture provides Dallas homeowners with high-quality, thoughtfully made furniture. Our kitchen and dining room tables and chairs are available in six solid hardwood options, and twelve unique finishes, so there is a combination to fit every unique space. Schedule a visit to our Dallas showroom in the heart of Deep Ellum and see our work in person. Image 1: The Bakers Field Table can be matched with your unique decor to provide a stylish dining space. Image 2: For a smaller kitchen or cozier feel, the Ward Round Table is a perfect option. Image 3: If you entertain regularly, the large Broadway Table can comfortably seat many.